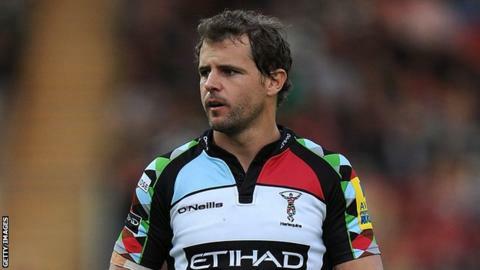 Harlequins fly-half Nick Evans has signed a new three-year deal with the Premiership champions, keeping him at the Twickenham Stoop until summer 2016. The 32-year-old, whose contract was due to expire next summer, had been considering a move abroad. "My decision was made easy by the ambition of this great club, the success we have had and the hunger to want more," Evans said. "There is no limit to what this team can achieve." The former New Zealand international has scored 1,184 points in 106 appearances for Quins since joining from Otago in 2008. Evans, who won the Rugby Players' Association player of the year award this year, says family reasons were a factor in his decision to stay in England. "Myself and my family are happy to have the opportunity to stay at Harlequins," he added. "I'm looking forward to continuing to play with a great bunch of lads and to working with a special coaching staff. "I will do my best to help the club stay one of the major forces in English and European rugby." Harelquins director of rugby Conor O'Shea described Evans, who won the last of his 16 caps for the All Blacks at the 2007 World Cup, as one of "the very best" players in the Premiership. "Nick contributes so much to this club both on and off the field and is the perfect role model for all young players," O'Shea said. "While I know one of the main reasons he is staying with us revolves around his family, ultimately it is about his ambition to achieve things with this club. "We have started something here and Nick wants to see it through."